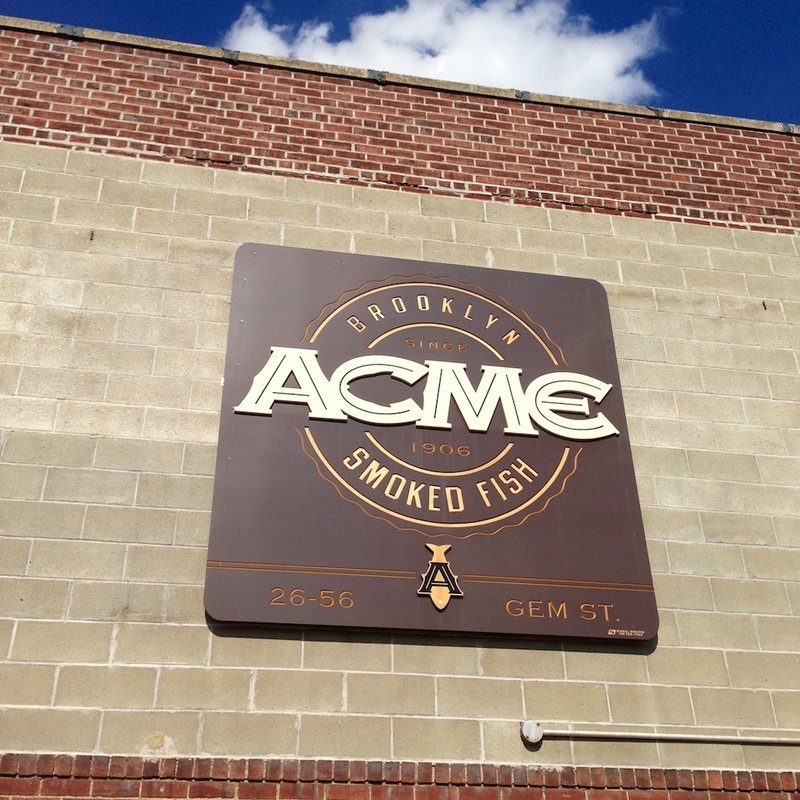 NYC Institutions | Acme Smoked Fish | A Continuous Lean. There’s something magical about a bagel and lox. A bite of crisp, chewy bagel and cream cheese draped with silky sheets of smoked salmon (and maybe some sliced tomato) provides one of the most satisfying flavor and texture combinations of all time. No wonder the sandwich has secured its place among legendary New York City foods like the pizza slice and pastrami on rye. Don’t get me wrong, I love a plain old bagel and cream cheese, but it’s only ever improved by lox. So naturally, in a city where lox can be found every few blocks, New Yorkers have a lot of opinions about where to get the best. 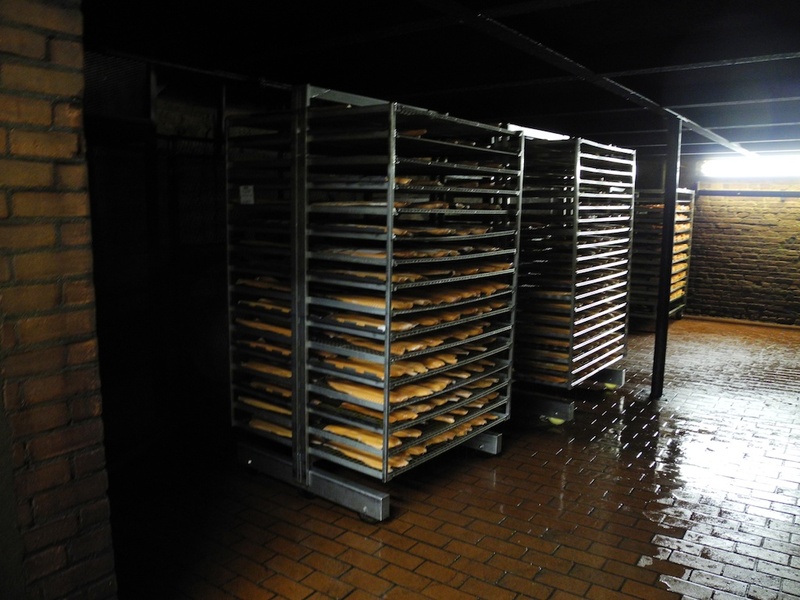 The largest smoked fish factory in the country, Acme Smoked Fish was founded in Brooklyn in 1954 and has been family-owned for four generations. Acme supplies smoked and cured fish to some of the city’s favorite fish counters including Zabar’s, Barney Greengrass, and my go-to spot, which prefers to maintain some mystery about its purveyors. They also ship hundreds of thousands of of vacuum-sealed packages of fish around the country every year. Chances are high that if you’ve ever eaten smoked salmon, it came from Acme. Acme’s factory on a tiny side street in Greenpoint might be hard to find, were it not for the glorious, smoky aroma that surrounds it. 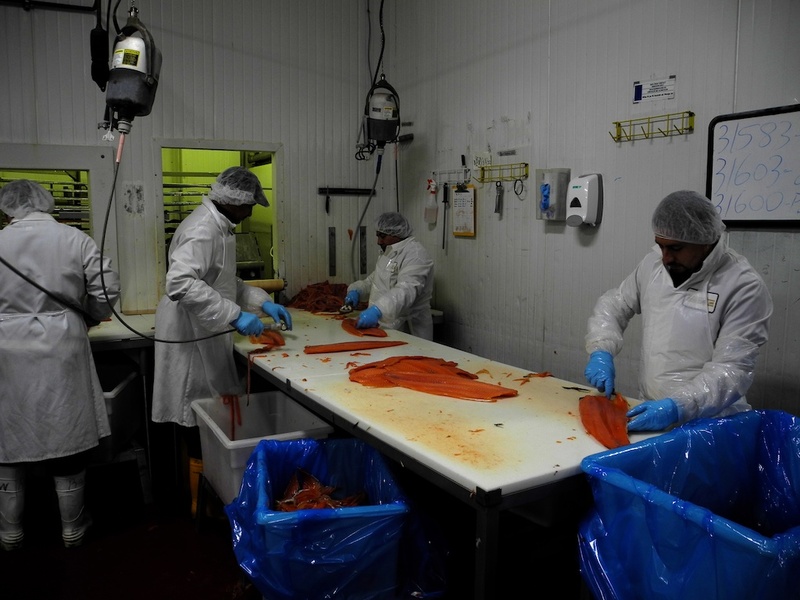 The company processes about a thousand pounds of fish per day, including salmon, whitefish, herring, and sturgeon. 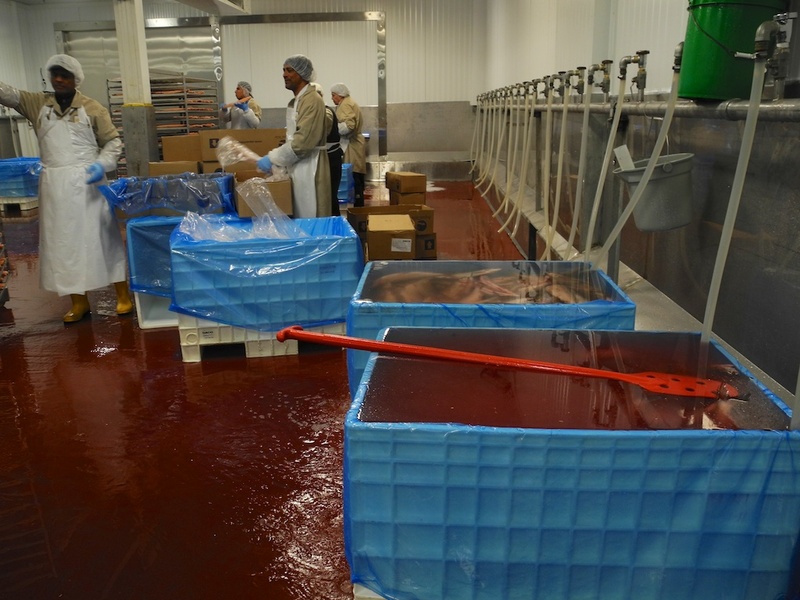 An on-site rabbi ensures that the few non-Kosher items produced at Acme (sturgeon included — no scales) are kept in a separate room from everything else. 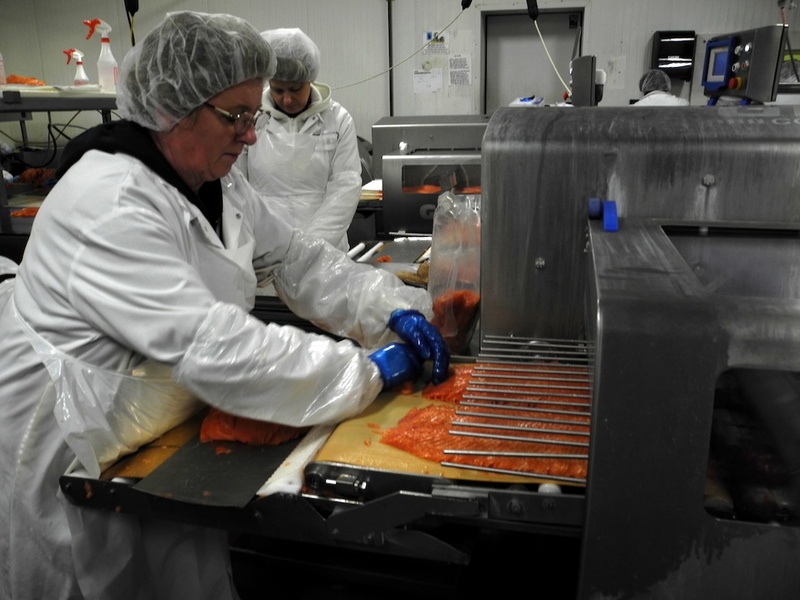 The day I stopped by the factory, workers were prepping fresh and frozen salmon fillets to be brined and hanging whitefish on racks for hot smoking. 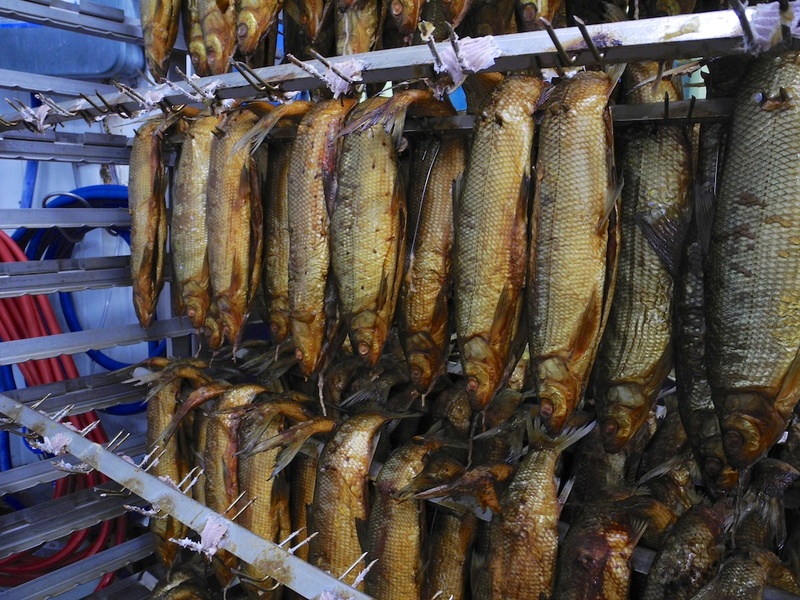 Methods for making cured or smoked fish vary depending on the type of fish used and the desired end result. All of the salmon at Acme is either brined in a bath of salt, sugar, and water or dry cured on racks after being coated with a mixture of salt and sugar. I’ve always used the terms â€œloxâ€ and â€œsmoked salmonâ€ interchangeably, but lox is salmon that’s brined for several weeks without being smoked, and what we usually think of as lox is actually nova or smoked salmon. 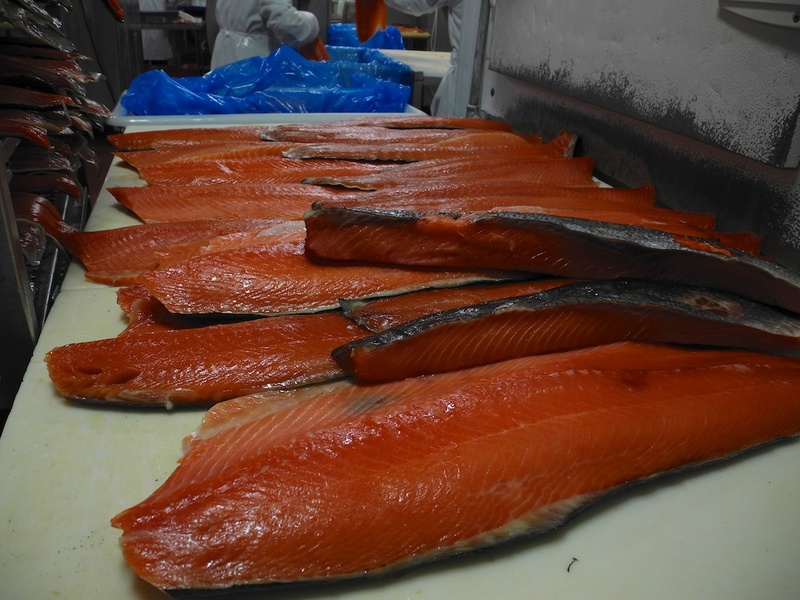 After brining for one to seven days, salmon that isn’t made into lox is cold or hot smoked. 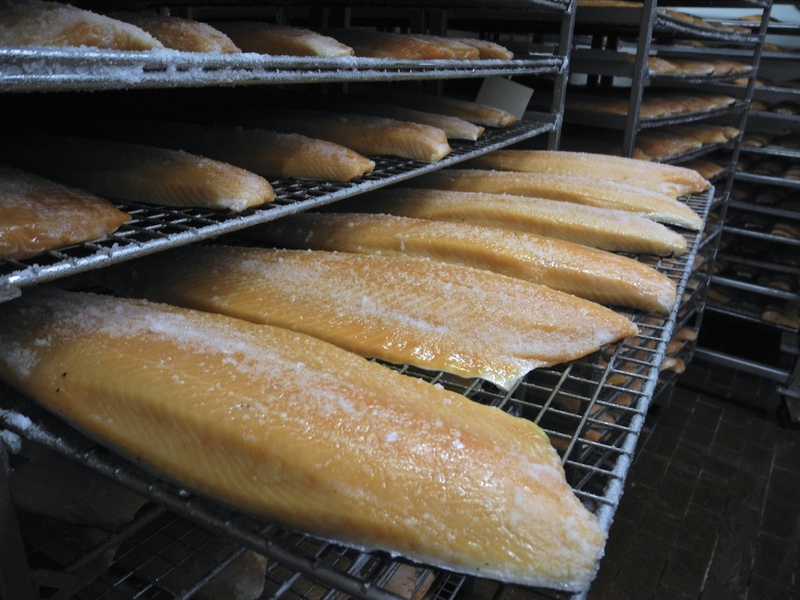 Cold smoking produces a rare, buttery texture, while hot smoked salmon is firm and fully cooked. 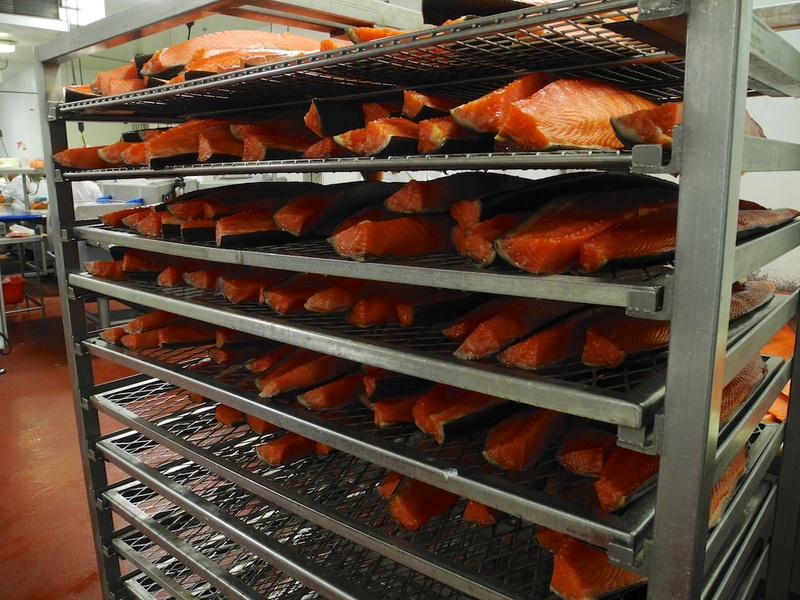 At Acme, cold smoked salmon goes into an oven the size of a large studio apartment where it is permeated with hard wood smoke for twenty hours. Smaller whole fish, like whitefish, whiting, and chubs are only hot smoked. 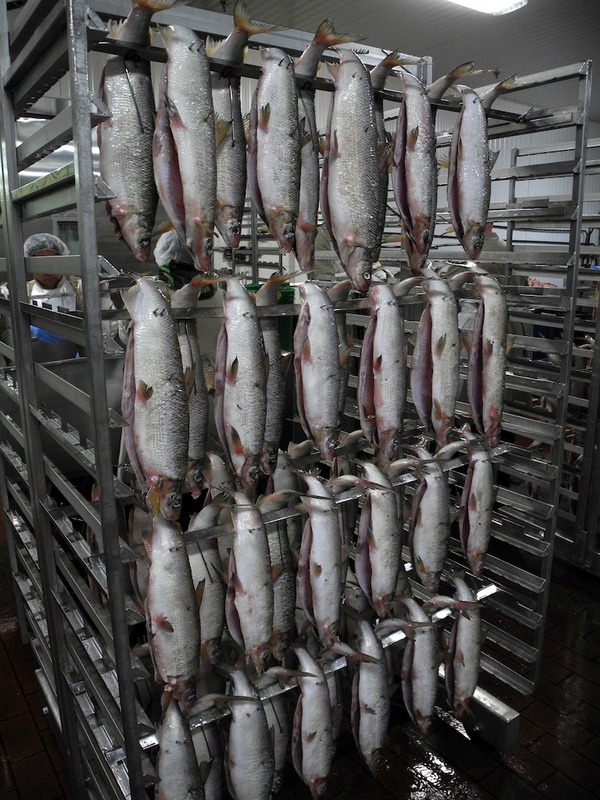 In the case of whitefish, once whole fish are hung on racks, they are smoked at a minimum of 145 degrees (the exact temperature depends on the weather outside) until they come out looking like shriveled little bronze torpedoes. 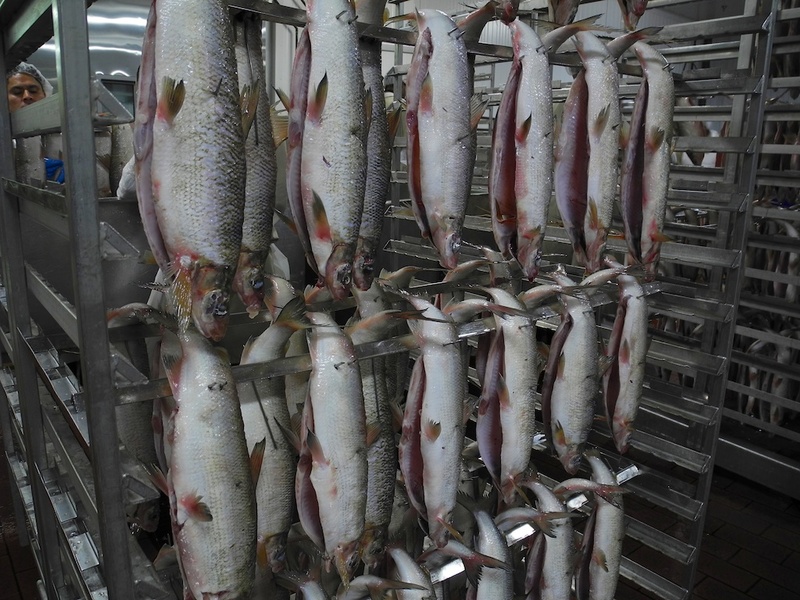 Much of Acme’s smoked whitefish is then run through a machine that skins and de-bones them and mixes the flaky meat with mayo and seasoning for whitefish salad. Very interesting article. I love fish as a leather for wallets, handbags and shoes. What a great idea – food. Really interesting article, Kate, thank you! Hooray, tomorrow is “Fish Fridays”. I’ve found three fish in Acme’s efishently amazing sign. Am I missing more? They make a great straight forward product, but your comment “if you’ve eaten smoked fish, chances are high that it came from Acme” is pretty exaggerated, almost a lazy comment. Living in the Northwest, there are a zillion local (some small, some higher volume) producers of (non atlantic) smoked salmon. Thats like saying if you’ve eaten cheese, chances are high it came from Wisconsin.